Pallus are by far the most intricately detailed part of the entire saree. It’s the very end of the drape, wherein lies the symbolic motif, the linear or other forms of designs. It’s got the ‘show stopper good looks that can make any saree drool worthy. All of this can be expected from the saree pallu. It’s because of this significance of the saree pallu wherein lies the criticality of draping it right. Try imagining a svelte figured lissome lady who has draped her saree well, but when it comes to the pallu , it seems to be all over the place! A saree can never quite be worn well, unless the draping gets the draping of the pallu right. Be it a heavy embroidered one, a woven saree or a simple printed kind; the very fact that the pallu has an eye-catching design, makes it imperative to draping it correctly. A wrongly done up pallu makes the saree lose its look that can ruin the very impact of an otherwise beautiful saree. Also, a wrongly pleated pallu or wrongly pinned one can also make the wearer extremely uncomfortable .One could end up looking too old fashioned, too extreme or overly radical with too much baring of the midriff. It could look messy with the pleats half up or riding down the shoulder because of too much weight of the pallu itself or its extra length. Height of the individual in a saree is important for deciding on the style of pallu drape. Pallu style also must be matched to the activity at the event. Wearing an overly flowing pallu when the job you would be performing is serving guests, is a bad idea. It’s not necessary that the pallu worn like some young starlet will suit your body type. Beware of this fallacy and try out neater pleats and drapes that compliment your shape. And yes-the most important, by ignoring your pallu and focusing on just the blouse will take a great deal away from the gorgeousness of the saree. 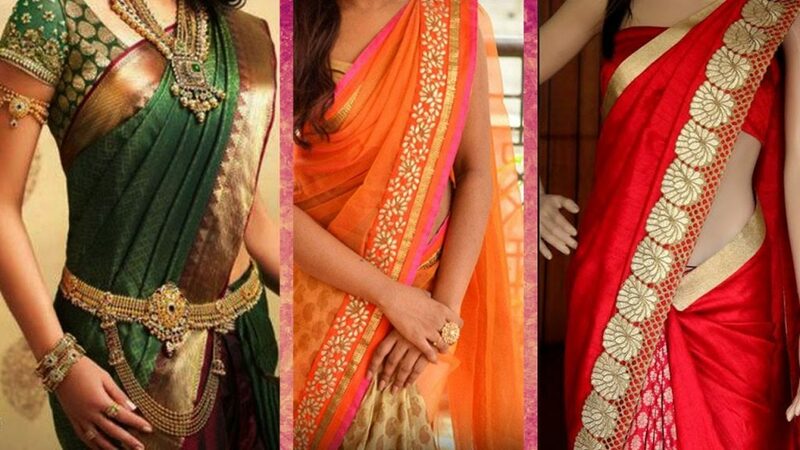 Professional and rather competent at keeping you very comfortable while draped in a saree is the age old favorite with those who like a more fuss free style of dressing-the air hostess pallu style. There ladies who host us high up in the air began a cult form of dressing that was seen as glamorous as well as practical at the same time . Smart and sassy, in the airhostess style the pallu has to be pleated in regular pleats and taken over the upper torso and pinned up neatly in such a manner that the midriff does not show at all. The width of the pleats must be the same as the width of the shoulder. Precision pleating followed by high tucking of the saree’s lower pleats must be coordinated. It is much admired for the neat look and the freedom it gives to your hands. The style looks best with high necked collared blouses. Quite frankly there is no other pleating style for pallu that comes close to the look of fragile beauty that is created with this simple yet highly effective pleating style. Best suited for light georgettes, chiffons, and crepes; the light as air fabric seems to create a little wing. For this, while the pleats maybe done in the same style, the pinning is different. Instead of covering the front completely, one needs to expose a little of the midriff pulling the pleats up and pin it on the left shoulder. The pallu is to be made to hang at the front and not the back. The magic lies in choosing a pin that has been customized to match with the colour or the motif that appears in the saree. As you can see in the second picture the other variation is taking the pallu and simply allowing it to hang from the right shoulder on to the front where the tassels could show. Smart and much in keeping with the love people have for a smarter version of sarees draping, here the pallu is as experimental as the blouse and the complete drape. The pleating is the same at the waist but from then on it moves up to the right shoulder from the back, showing off the hand worked crepe border done in Gujarati stitch. The belt across the svelte waist makes for an interesting twist of severity to the look while the loose hanging pallu falls in neat fold below the knees. Undeniably here the pleats of the pallu are the same but the similarity ends there. The drape of the saree will need you to take double the length of the pallu as compred to the normla length. It rises to the left shoulder from very low down the front of the saree, unlike in the coventional pallu that rises across the waist and under the arm. 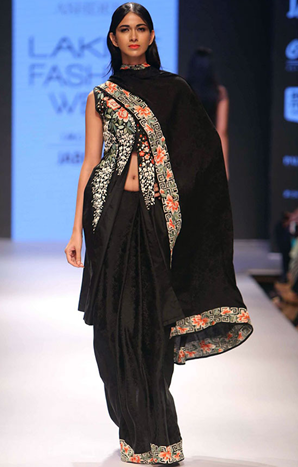 The belt secures the long droopy pallu at the wasit which is supported by a pin at the shoulder. Making this more intertsing would be by wearing a jacket style blouse with lots of embellishment. This version of pallu is for those who love to take their saree look to quite another high. Inspired by the dupatta, all one has to do is drape the saree as usual and wear a short or long jacket, preferably, with it. 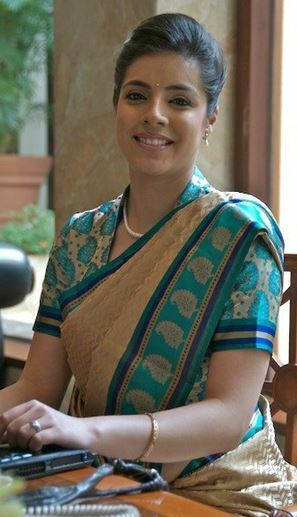 Instead of the pallu coming over the front and then climbing over the left shoulder, after the initial pleating, the rest of the saree goes over the back , emerging near the collar on the right hand side. 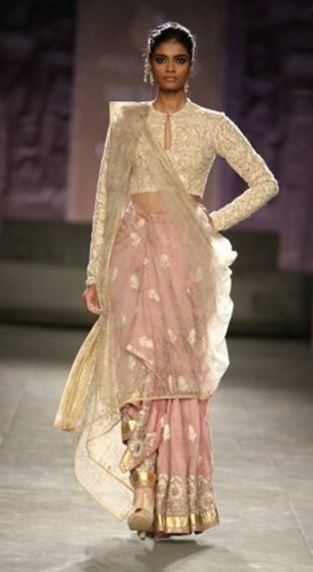 One can then use the rest of it more like a dupatta across the front or allow it to simply fall in a graceful cascade. Choose a crepe or any material that has an embroidered border, for maximum effect. Very elegant even on the most formal of occasions, giving one an amazing scope for stylizing with one’s blouse. 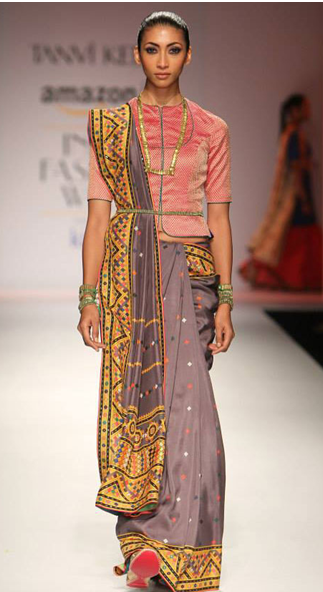 In this style like the Gujarati drape the pallu comes over the right shoulder in neat pleats. One simply takes one end of the lower pleat and tucks it in at the waist. This style would look as amazing on traditional silks as it would on tissues, nets and organzas, which could be teamed with a long sleeved lace blouse for maximum effect. It’s when one takes a good look at the pallu that one realizes how definitive its role is in the entire look of the saree. 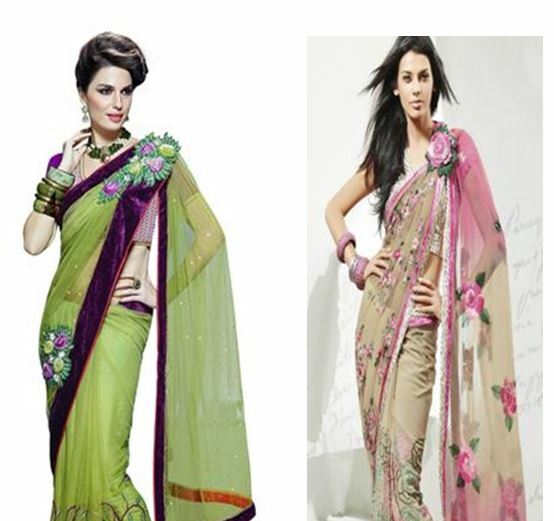 So choose wisely the form of pallu pleat you would like, depending on style of saree, occasion and comfort level.